Okay, so this piece has nothing to do with the song (if you know the song, ten points to you). But there are a lot of new and exciting things happening. First of all, I found out last night that a short story I wrote has been selected for publication in a new Anthology coming out in May! The Anthology is called Lurking in the Deep and it features a collection of stories centered around water-based fears, i.e. sea monsters, mermaids, ghosts of those lost at sea, etc… As soon as I found out about it, I knew I had to submit something. 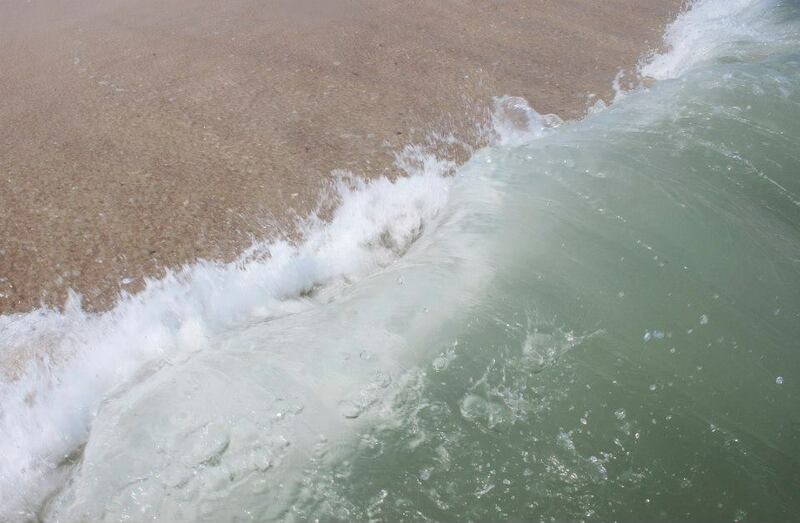 I love the ocean, as you all know, and I love scary stories, again, which you all know. 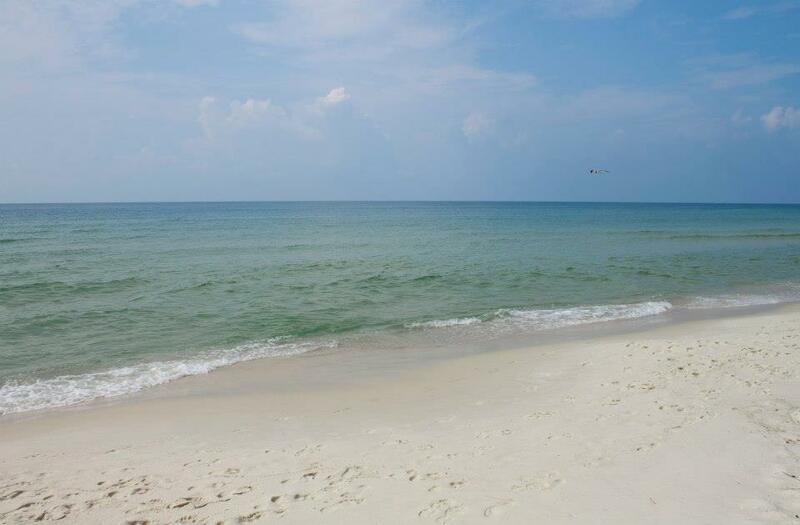 Just for the record, the ocean in my story is a lot more sinister than Gulf Shores, Alabama. Another bit of exciting news that I’d like to share is that my dear friend Paula has just published her first children’s book! It’s called Jack Learns to Grill and it is so, so, so cute. 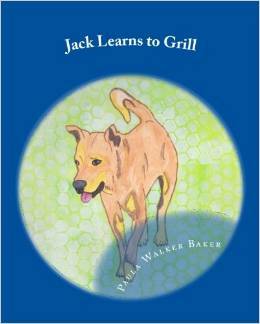 It’s the first in a series about her dingo, Jack, in which he learns new skills and lessons about life. 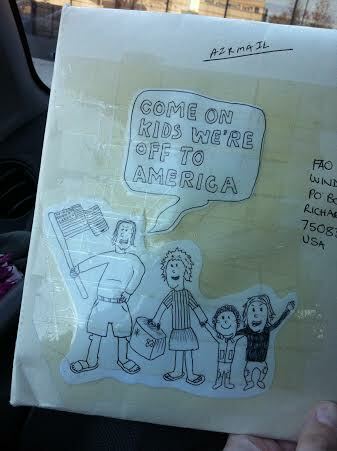 It is beautifully illustrated by Tana Jacks. If you have children in your life or if you’re an animal lover, I hope you check it out! It’s a darling book! Finally, I think I’ve come up with a new idea for a few blog posts, but I’m going to have to work on them a little bit to see if it’s actually going to be something worth pursuing. I’ll let you know! Also, thank you to all who’ve sent me pictures of Cemetery Tours! Keep ’em coming! In honor of Friday, I thought I’d take the day off of business stuff and just post something fun. Okay, it’s still sort of about writing, but it’s silly and cute, not “hey, go buy my book” and miniature progress reports. “Mummies scare people on Halloween night. Spiders bite on Halloween night. Pumpkin faces glow bright on Halloween night. Ghosts arise on Halloween night. Witches go back and forth through the air. I have to admit, I cracked up. I spent an entire book (or like, six pages) writing about all these monsters and what they do and I ended it with “Frankenstein.” Smart kid. A few other gems include lines such a page from my Dallas book, “This is a cactus that is sharp,” and “This is a tortilla growing in a tortilla patch.” Now, I don’t know if I thought I was being funny or if I actually believed that tortillas grew in tortilla patches, but I still got a pretty good laugh out of it. 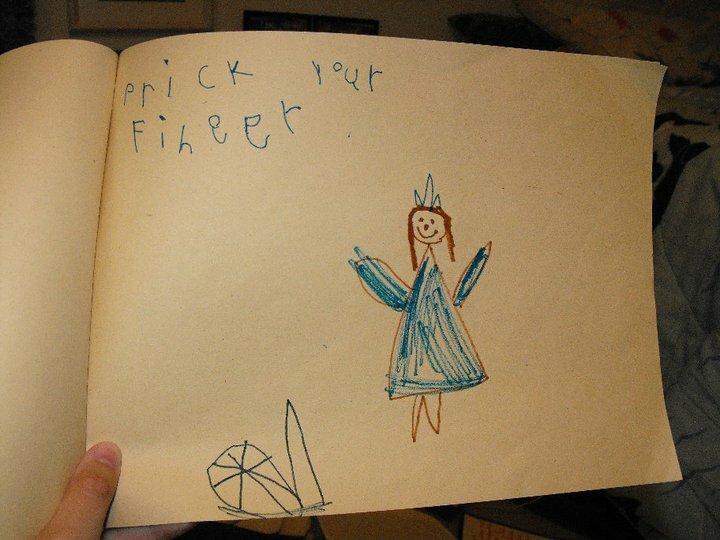 I also found an old alphabet book that I wrote. I was particularly impressed by my choice for O.
It’s kind of cute. I was smart enough to know what an opal was but not smart enough to know not to write my lower case a’s backwards. 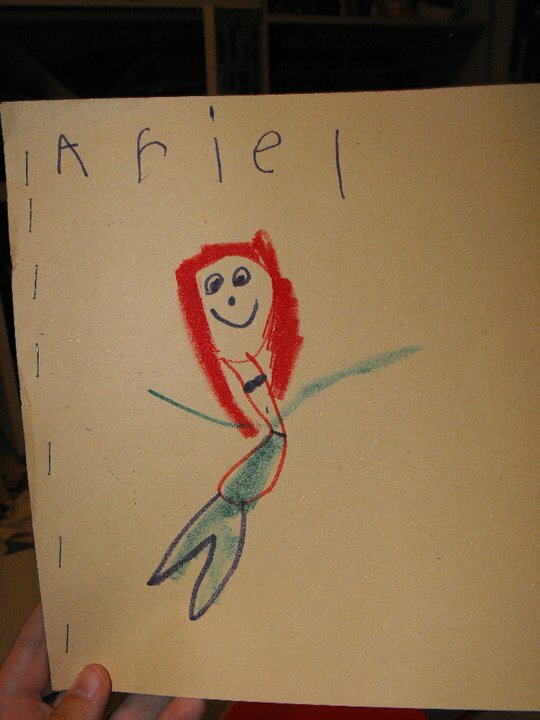 I was so obsessed with Ariel. This one was written before I figured out that J and L are not the same letter. 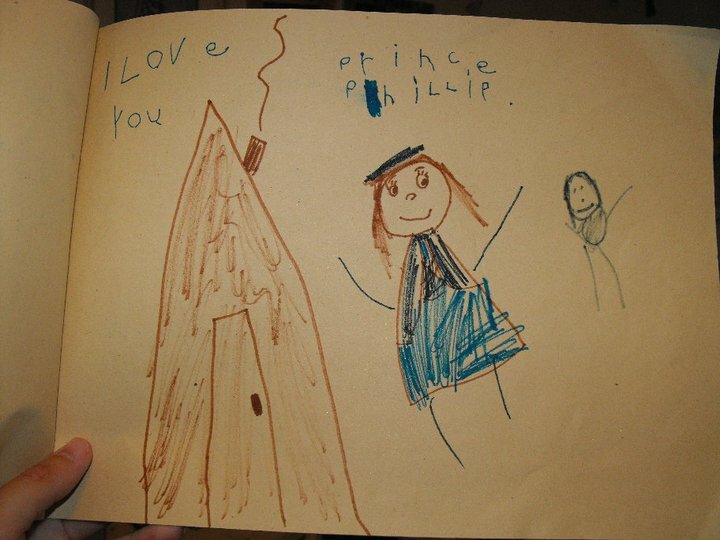 Apparently, Prince Philip was not important enough for color. 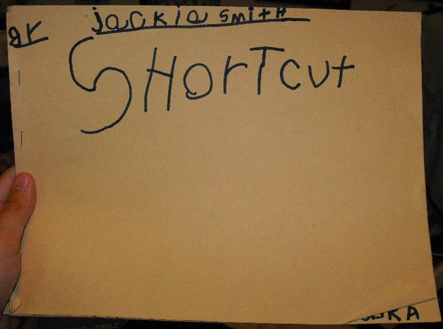 But the first book I ever “wrote” was inspired by Donald Crews’ Shortcut. I still remember my pre-k teacher reading it to us like it was yesterday. It was about a group of kids who had stayed out past dark, so they decided to take a shortcut home along the railroad tracks. Near the end of their journey, they heard a train whistling in the distance, and they knew it would be coming along the tracks. In my head, that train whistle in the night was so eerie, and I remember feeling chilled and a little scared. It was the first time a book had gotten to me like that, and I was fascinated by the idea that words on a page could be so powerful. I decided right then and there that I had to have that book, but instead of going out and buying it, I wanted to recreate it for myself. So, there you have it. 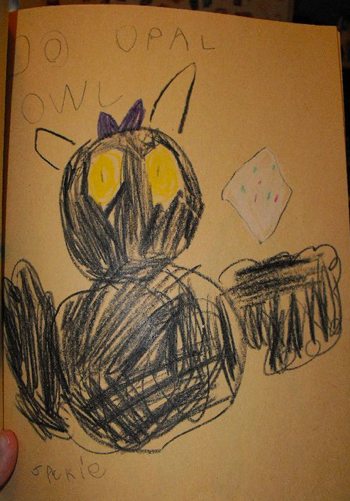 A small glimpse into the early days of my writing career. Hey, we all have to start somewhere. You know, I didn’t realize that writing was what I wanted to do with my life until my junior year of college. Looking back, I can’t believe it took me that long to figure it out. I’ve been writing for fun and therapy since the day I learned the alphabet. Granted, it took me a while to master a few letters, but overall, I think I’ve got them down. Though I’m still a little iffy on 5’s if I’m being totally honest. My hand has just never felt comfortable writing 5’s. Anyway, before I sign off for the day, I also wanted to share this adorable picture of my kitties when they were babies. 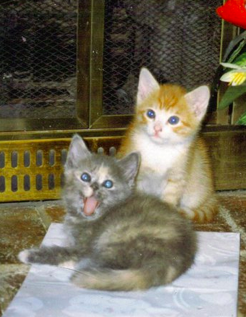 Sadly, my sweet Rusty (the orange one) is no longer with us, but Jazzy (the one with the tongue) is still alive and happy, even though my sister says that in this picture, she looks like an “aloof doofus.” Mean. Something I like to do as a semi-active blogger is to scroll through tags that interest me, Books, Authors, Reviews, etc… If I find a blog that I like, I’ll follow. 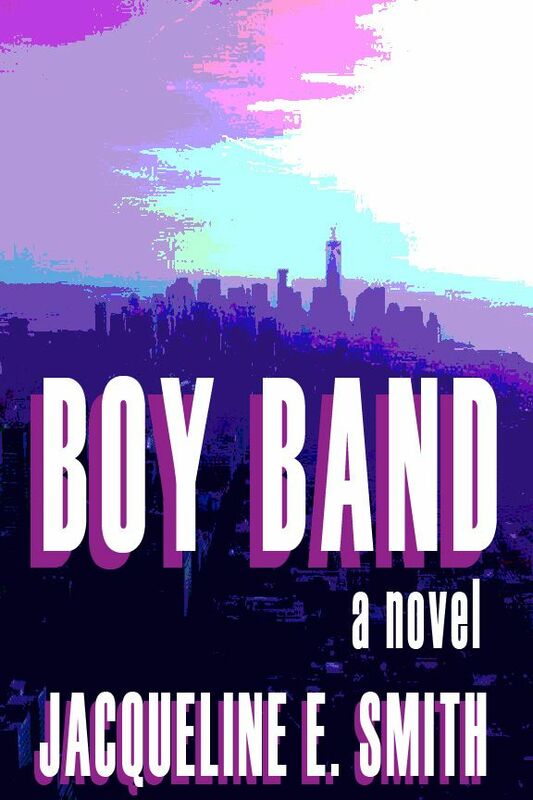 About a month back, I was scrolling the Author tag and happened across the blog of Miss Heather Ellis (http://heatherellisbooks.wordpress.com). 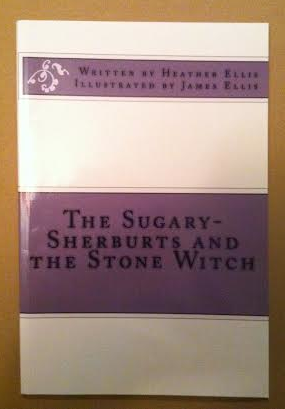 She is a young author from England and she’s just published her third short story book for kids, The Sugary Sherburts and the Stone Witch. As it turns out, Heather is a kid herself, just ten years old. How cool is that? I mean, seriously? To be a published author of not one, but THREE books at ten years old? Want me to tell you what I was doing when I was ten? I was either running around the house, throwing my Beanie Babies across the floor so that I could pretend to save them from “tornadoes,” or dressing up like the Spice Girls and singing “Wannabe” at the top of my lungs. That was the kind of kid I was. Anyway, I told Heather that I would love to read one of her books, and after a long month of waiting, the Sugary Shuerburts finally arrived in Texas! 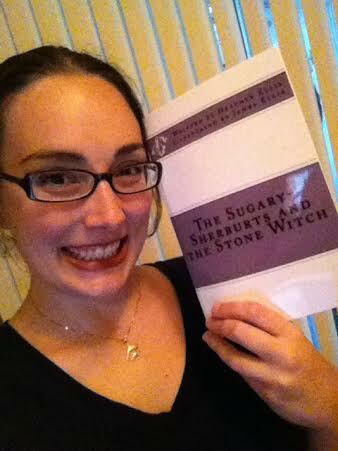 This is a picture that Heather sent me… the Sugary Sherburts about to begin their journey across the pond! And this is shortly after their arrival in Texas! 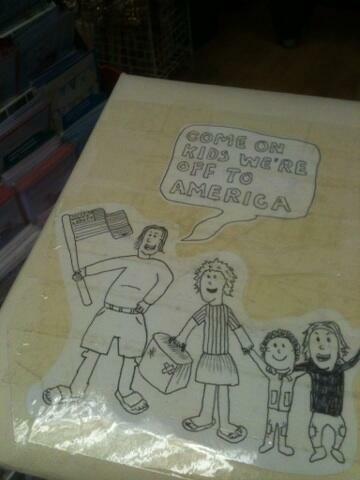 Note: This is the package, not the actual book cover. 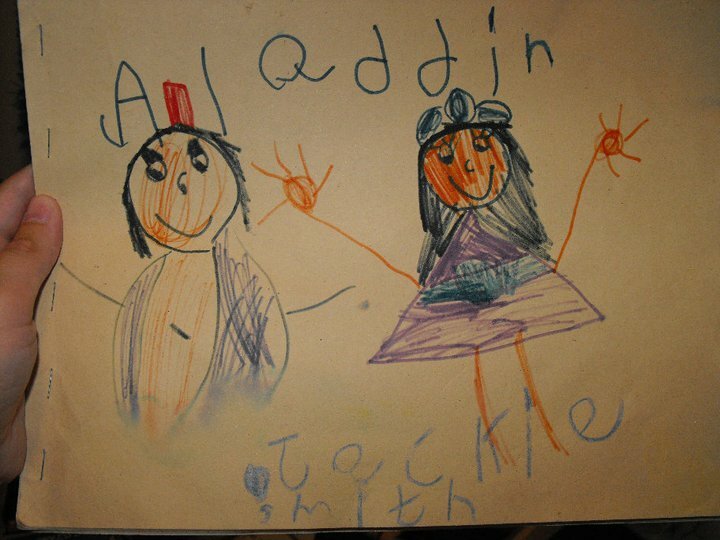 I just love the drawing! 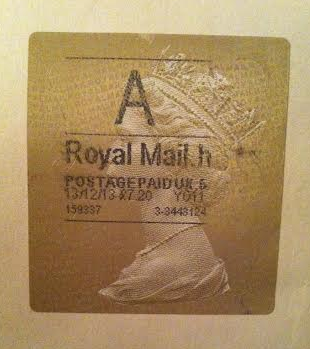 I just had to take a picture of the postage stamp. Europe is so cool. Anyway, this is the actual book! Again, how cool is this?! I showed the book to my sister (who also plans to read and review), and she said, “That’s so cool! It reminds me of Matilda!” Well, it just so happens that on the back of the book, Heather lists Roald Dahl as one of her influences! Such a great author and such a good story (my sister is a HUGE fan of the new musical adaptation). This is me and the Sugary Sherburts! Stop by and check her out! 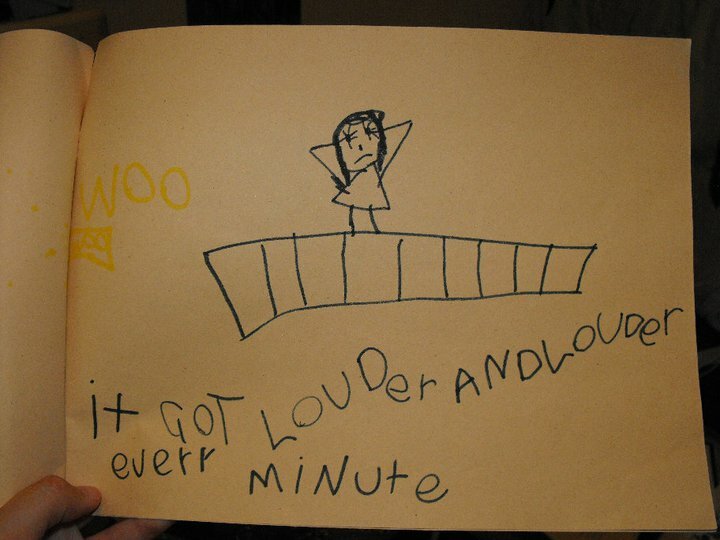 This kid is going places!